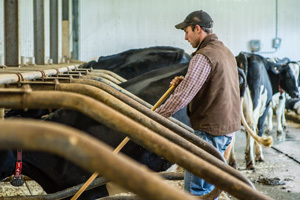 The amount of work that David and Sara Simmons have put into their dairy farm is outstanding. That’s why, just weeks ago, they were named Atlantic Outstanding Young Farmers for 2015. The award is presented to farmers from the age of 18-39 who have demonstrated excellence in their profession and who help to promote agriculture. It recognizes farmers based on production history, business management and community involvement. 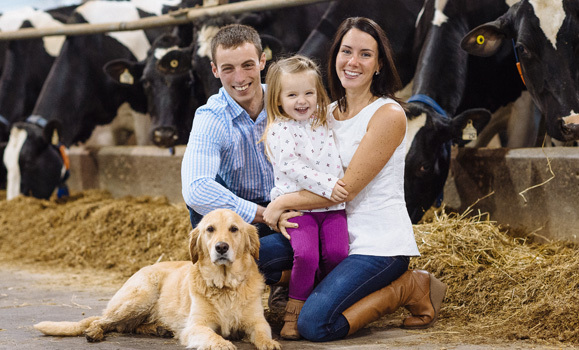 This year, David (32) and Sara (30) Simmons from Pure Holsteins were selected as winners chosen from across Canada. Pure Holsteins is a dairy farm based in Little Rapids, Newfoundland. They milk 100 cows, have 85 heifers and lease 60 acres of pasture from Hammond Farm, owned by David’s family. Not only do they have dairy cows to generate a profit, they have cows for pleasure as well. They have remarkable genetics in their herd that allows them to show their cows. Both David and Sara have a long history in agriculture. 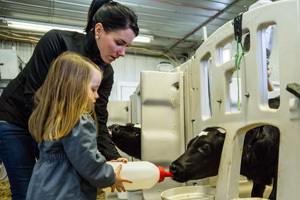 Growing up on a dairy farm in New Brunswick, Sara has been showing dairy cows since she could walk. Although David grew up on a poultry farm, he began showing dairy cows when he met Sara. Together, David and Sara purchased all dairy equipment from Hammond Farm in October 2011. Since then, they have been working hard to add more livestock, purchase more quota and improve the productivity of their operation. In increasing their productivity, Sara and David recently purchased two Lely A4 Robots- machines that will milk the cows automatically. 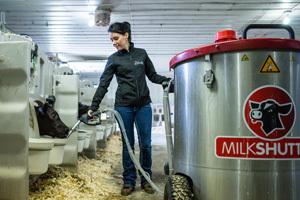 The first of its kind in Newfoundland, the machines have stalls on the outside of them so when a cow is ready to be milked, she moves into the stall. An identification collar around her neck keeps track of her milking schedule and her health information. If the robot detects the cow isn’t ready to be milked, it will encourage her to leave the stall and prepare for the next cow. When a cow is in the stall ready to be milked, an automated arm moves in cleaning and disinfecting her udder. The cow is fed grain while she is being milked. A 3D camera detects her teats and the inflations are attached to her udder. During the milking, the robot records information about the cow. It records her weight, temperature of the milk, ketone levels of the milk and somatic cell counts. This information is monitored every day and is a proactive measure to keeping the cows healthy. Each cow takes about five minutes to milk. Once she is milked, she moves out of the stall and the robot disinfects and prepares for the next cow to enter. Although the milking process is completely automatic, David isn’t entirely off the hook. If something were to go wrong, the robot calls David on his cellphone to alert him of the problem. The robotic milker operates 24 hours a day, seven days a week. David and Sara check the cows every morning and night to see if there are any that need to be put in the robot for milking. Pure Holsteins would not have been able to purchase the robots without some additional funding. Under the Growing Forward 2 Innovation Fund, they received $345,000 from the Federal and Provincial Governments. The company also received $40,000 from the Provincial Agrifoods Assistance Program. It’s not just Sara and David who spend much of their time around the farm. At the age of four, their daughter Felicity loves helping out as much as she can on the farm. Farming always has its challenges though. Sara explains that the farm wouldn’t be where it is today without having encountered and overcame the challenges they were faced with. For the Simmons’, the future looks bright. Having started from the bottom and worked their way up, David and Sara are now ready to purchase more quota and breed long lasting cows. With dedication, patience and support from their family and friends, David and Sara have worked tirelessly in an upward battle to become what they are today- outstanding young farmers.